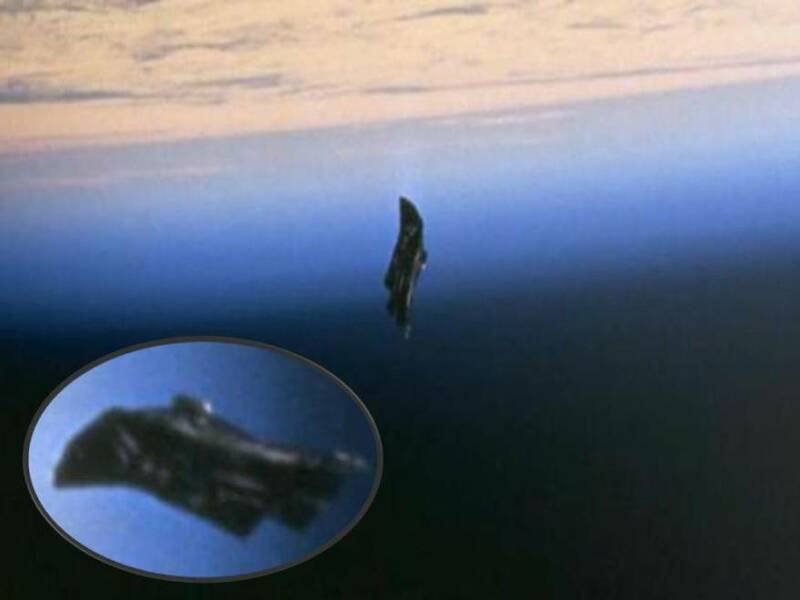 You are here: Home / Trinfinity & Beyond by Dr. Kathy J. Forti / Blog / The Mysterious Black Knight Satellite – Who Really Owns It? 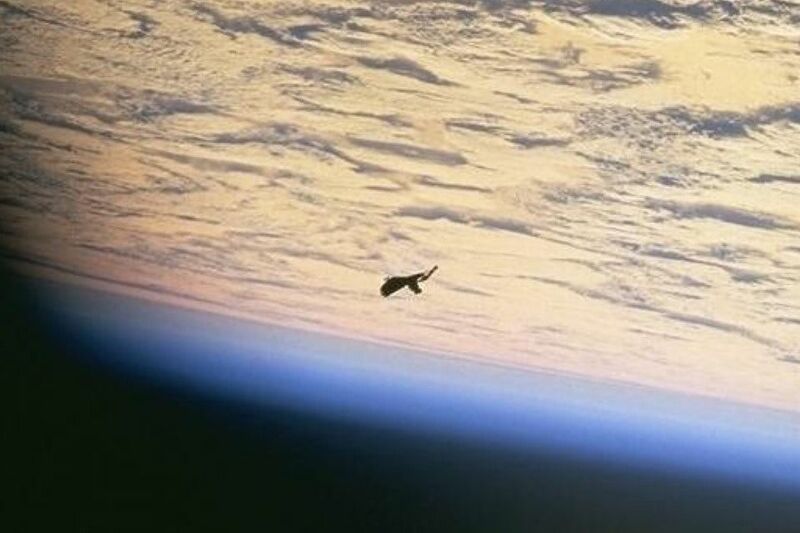 The Mysterious Black Knight Satellite – Who Really Owns It? The Black Knight satellite is one of those space mysteries that will continue to perplex everyone. Back in the early 1950’s when it was first discovered, the U.S. thought it belonged to the Russians and the Russians thought it belonged to the U.S. Its discovery pre-dated man-made satellites launched in space, so its true ownership remains questionable. Consequently, many claimed it had to be of extraterrestrial origin operated by beings keeping tabs on us. This story goes way back… In 1899, Nikola Tesla picked up unusual signals from an unknown source on his high-voltage receiver in Colorado Springs which he speculated were “intelligently controlled signals” that originated “from another world.” Astronomers have reported picking up similar radio signals since the 1930s. It was Dr. Lincoln La Paz, of the University of New Mexico, who first sighted the mysterious satellite-like object in 1953. The U.S. Department of Defense commissioned astronomer Clyde Tombaugh to look for it. Word quickly spread and a famous article about the Black Knight was published in The St. Louis Dispatch and The San Francisco Examiner on May 14th 1954. The story highlighted an interview with retired Marine Corps Major Donald E. Keyhole who stated that Earth was being circled by one or two artificial satellites. He added that government scientists at White Sands, New Mexico, were making every effort to locate and chart these satellites to determine origin. This news article was written three years before Russia would launch the Earth’s first satellite, Sputnik 1, and the U.S. would follow a few years later with their own. This was the Cold War Era and the beginning of the age of spy satellites. Both NASA and the Pentagon quickly claimed it was space debris from their early Discoverer satellite program. The Discoverer V program was covertly part of the “Corona Project.” It was one of the first U.S. classified spy satellites in space during the Cold War with Russia. Only one problem with this explanation. Neither the U.S., nor the Russians had the capability for Polar Orbit when the Black Knight was spotted during 1953, and the first Corona launch attempt did not occur until August 13, 1959 where it fell to Earth on September 28, 1959. A successful launch would not come until 1960—so they claim. It is interesting to note that on the heels of the Black Knight discovery, both the U.S. and Russia quickly got into the space reconnaissance business. Were they trying to get equipment up there and see for themselves what this strange alien-based satellite was doing? “Interest in the Black Knight was higher each year. In 1957, an unknown “object” was seen “shadowing” the Sputnik 1 spacecraft. According to reports, the “unidentified object” was in polar orbit, at that time. The United States nor the Russians possessed the technology to maintain a spacecraft in polar orbit. According to our research the first polar-orbiting satellite was launched in 1960. Polar orbits are often used for earth-mapping, earth observation, capturing the earth as time passes from one point and reconnaissance satellites. This would put the Black Knight in the category of an observational satellite. The only question here is, who placed the Black Knight in a polar orbit and for what purpose? The object continued to amaze astronomers world-wide. In the 1960’s the Black Knight was located once again in polar orbit. Astronomers and scientists calculated the object’s weight to be over 10 tons, which would be at that time the heaviest artificial satellite to orbit our planet. The Black Knight’s orbit was unlike any other object orbiting Earth, as it was moving twice as fast when compared to any other man-made spacecraft. There are also several reports that the Grumman Aircraft Corporation gave much importance to this mysterious “Satellite.” On September 3, 1960, seven months after the satellite was first detected by radar, a tracking camera at Grumman Aircraft Corporation’s Long Island factory took a photograph of the Black Knight. At that point people all over the world started identifying the object in the sky, which could be seen as a red light moving at higher speed compared to other satellites in an East to West orbit. The Grumman Aircraft Corporation formed a committee to study the data received from the observations made but nothing was made public. Even though Cooper was known to be sympathetic to the UFO disclosure movement, he later recanted his initial report. One can only surmise his admission really pissed off someone at NASA. After all this time, one wonders why NASA and/or the Russians haven’t tried to capture this mysterious satellite and put speculation to rest. The American Space Shuttle has a payload to polar-orbit launch capacity of about 14 tons, and payload recovery capability of about 16 tons. 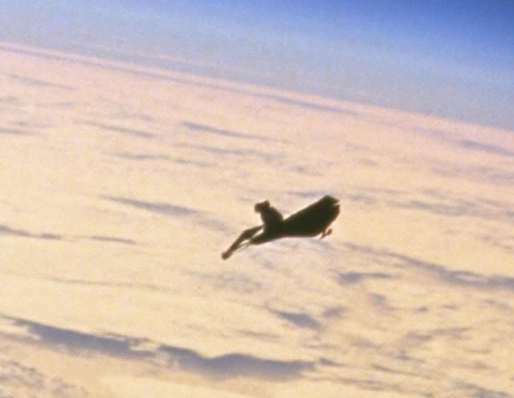 Depending on the physical volume of the Black Knight satellite, it is conceivable that the object might have been recovered and returned to Earth during one of the classified missions of the shuttle. Then again, perhaps they have already attempted this. Maybe they even know the satellite’s true origin. If so, they’re not telling us and the information will most likely remain classified. The object is still believed to be in Orbit to this day. NASA’s explanation to what the object is has changed several times and some stories have often been fused together. NASA also claims the object is a thermal blanket that got loose during the STS-88 space mission in 1998. But that mission was long after the first sighting of the Black Knight. While this thermal blanket is probably up there floating in space somewhere, along with other space junk, to explain it as the Black Knight is really a stretch. Right now there are somewhere in the neighborhood of 100,000 man-made objects orbiting Earth. Some are multi-billion dollar military satellites, or telecomm satellites or even scientific instruments. Most are space junk off of old spacecraft and/or dead satellites. Yes, we have even polluted outer space with our garbage. There are reports the Black Knight was spotted near the moon by the International Space Station (ISS) crew, but I haven’t seen the pics. One day this satellite enigma will finally be solved. Are we indeed being watched? One of Nostradamus’ prophecies seems to certainly suggest this. Time will tell. https://i1.wp.com/www.trinfinity8.com/wp-content/uploads/2016/02/faces-on-mars-alien-satellites-and-moon-bases-5-unexplained-nasa-photos-explained-424309.jpg?fit=960%2C640&ssl=1 640 960 Kathy J. Forti https://www.trinfinity8.com/wp-content/uploads/2014/05/FINAL_trinfinityLOGOrevised-for-web-logo-300x174.png Kathy J. Forti2016-02-25 15:05:542016-02-25 15:05:54The Mysterious Black Knight Satellite - Who Really Owns It? I found a unknown sci-fi novel published in 1960’s. A black knight satellite from unkown origin was already mentionned. Thank you for sharing a complete analysis of this mystery. I like your post but, what if it was man made are you sure? I’m quite sure it’s man made, but it has been in orbit pre-space age on Earth, as we know it. Which leads us to question if space technology existed centuries ago during lost civilizations that were more advanced then we now know. Hitler was always having his scientists research and build variations of weapons and even hired many a scientist to spend all of their energy on space flight. Hell, it is was not for these same scientists, we would never have made it to space in the first place. Could this not be one of his many scientists failures or successes? Just curious on your thoughts. Please feel free to email me with your thoughts as I am really curious on them. I have been studying WWII for many years now and could this be just another one of the many mysteries that nazi scientists partook in? Since this satellite was spotted before the space race, or even the secret space program (so they say), it is unlikely that it originated from the Nazi rocket program in the 1940’s.It most likely came from another planetary system, like those bases on the far side of the moon. Please find out Indian ancient book about Ramayanaya. In this historical book saying king Rawana of sri Lanka, he has 3 great wepon kept on jet steam space and use it for wars. This weapon means Could be satellites. And this history is before 4000 years to 10000 years old. Also king Rawana has flying objects and deal with alien planet’s. Read about waalmiki Ramayanaya.